The house consists of a very spacious living with harmonica sliding doors giving access to the terrace, making it one big living space. 4 King sized bedrooms (respectively 20, 2x 16 and 14,5 square meters), 3 bathrooms and a large, open-plan kitchen fitted with modern appliances. However, possibly the most beautiful spot is also the least complicated one: the bale benong! The Balinese equivalent of the gazebo, located directly at the beach, with a mattress and lots of cushions. 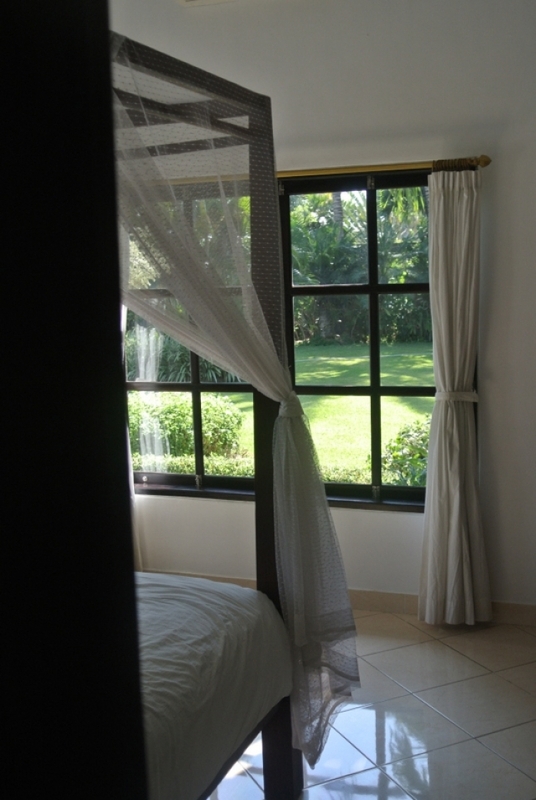 Great to dream away at night or for an afternoon nap The villa is surrounded by a tropical garden, has its own little banana plantation and a private pool. The pool is made of dark blue stone, which makes it perfectly integrated in the amazing paradise landscape. 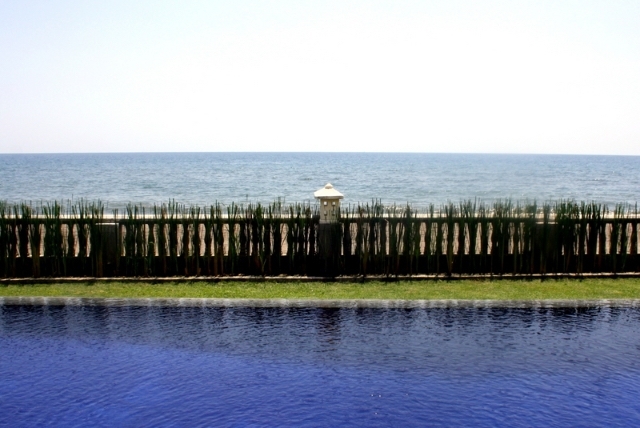 The villa has 43 meters of beachfront and hence unrestricted sea view. The (almost) private beach (which is cleaned daily) can be accessed directly from the garden ! You can enjoy a beautiful sunset, snorkel or dive in calm, warm and clear water. Or, an absolute must: set sail at, or even before, sunrise to look for the dolphins. The chance of actually spotting one is over 80%. Sometimes the boat is surrounded by hundreds of jumping, playing and blowing dolphins. A lot of fun and very special. The villa is ideally situated for day trips ( temples, waterfalls, rice terraces, Ubud, Sinjaraja, Lovina, Munduk, snorkling, vulcano’s, … ) There will be staff at the premises day and night. During the day our housekeepers, both named Komang, clean the villa; They'll wash and iron the laundry that you put in the laundry basket. Komang worked in a restaurant before she started working for us. She loves to cook for our guests : an extensive breakfast, lunch or dinner for 8. Villa Branie has an English speaking helpdesk. Sandra will welcome you and will try to answer any questions you might have. During your stay you can always ask them for advice. They can also assist you with the booking of trips or activities. If you want to book before leaving for Bali,, we’ll be happy to assist you . 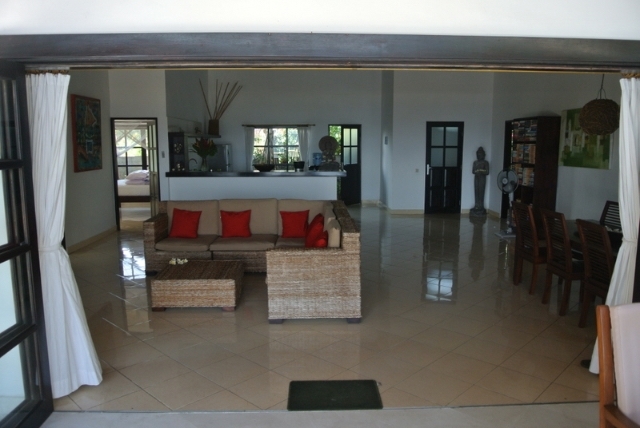 The villa is fully equipped, including television, DVD player, DVD’s, books, water dispenser, WIFI connection, baby chair and bed. We can arrange transport with our private driver from and to the airport if required. You'll arrive at Denpasar airport. The driver will wait for you in the arrival hall, holding a sign with your name on it. In his van he'll take you to Lovina, in the north of Bali. This will take approximately 2.5 hours (depending on traffic). The cost for this service is 650.000 rph (circa 50€) based on a maximum of 4/5 persons (depending of number of pieces of luggage). For5/ 6 to 8 persons we will have to use two drivers, which means twice this price. For your trip back to the airport you can agree a time with the driver yourself. At the villa you can call the private driver anytime 24 hours a day. This can be for short distance rides (Lovina, Singaraja) or for a day trip. Prices vary from 80.000 Rph (€6,-) to 650.000 Rph (ca € 50-) for a whole day. Prices are for the van and driver, not per person (max 6 persons, for more persons you need two cars). If you book a day trip locally, most operators will pick you up from the villa for free. If you decide to do a dolphin tour you can even be picked up by boat in front of the villa.